This rising in earning on 24 Numbers variant is played only on dozen. This martingale is a "dozen martingale ". If we win, we are beneficial, and then we continued to play a dozen on each unit. If we lose, we will try to erase our loss. He must then double bets on 2 dozen. Last Total: 4 Units. If we win we must divide by 2 bets. This will be beneficial up. It will then resume the game with the latest base. 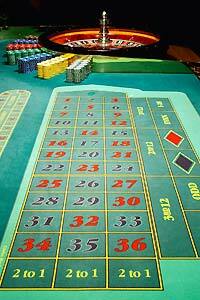 With this martingale you play 24 numbers of 37 instead of 18 for other methods on the outside bets. Your chances of winning at each stroke are 64.8% against 48.6% with a game based solely on simple chances. This "martingale dozen" opens a new strategy of play. We must understand that there are phase of play. If there is no loss to erase, the gains are net and are capitalized, "set aside". When you lose, the real game, which is to erase the losses and go back to zero, begins.